With a 0-60mph time of just 8.5 seconds and combined EC lab test mpg of 62.8, the new Astra 2.0 CDTi Start/Stop Hatch really is a case of having your cake and eating it. By adding Start/Stop tech to the existing Astra 2.0 CDTi Hatch, Vauxhall has not only maintained the model’s robust performance, but reduced its fuel consumption and CO2 emissions, too. Compared with the outgoing 2.0 CDTi Hatch, the Start/Stop version’s fuel consumption improves by over 5mpg in the EC lab test combined cycle, from 57.6mpg to 62.8mpg. Naturally, drivers will theoretically experience the biggest fuel consumption gain around town, where Start/Stop has meant a gain of 13 per cent in the EC test urban cycle. Better still, for business users, Start/Stop tech on the Astra 2.0 CDTi Hatch has dropped certificated CO2 emissions from 129g/km to 119g/km, meaning that the model’s BIK rate (percentage of the car’s price to be taxed) for standard rate tax-payers is down by five per cent to 13 per cent. And both private and business users benefit from the Start/Stop’s lower VED, which will save them £65 each year (down from £95 to £30). Start/Stop is also available on the latest addition to the Astra range, the Sports Tourer, which benefits from an equally impressive 4.7mpg rise on the combined cycle, from 55.4 to 60.1mpg, though this doesn't quite squeak into the £30 VED bracket. The Astra 2.0 CDTi Start/Stop also incorporates Vauxhall’s CleanTech Combustion Technology, which guarantees exceptionally clean combustion and reduces engine noise, too. CleanTech is a closed-loop system which adjusts fuel injection to the combustion process in real time. Combined with reduced friction camshaft bearings, the system ensures that the engine runs more quietly and efficiently. Vauxhall’s automatic Start/Stop system reduces the engine’s time spent idling, and therefore the car’s overall emissions and fuel consumption, especially during town driving. The engine automatically stops when the driver engages neutral and releases the clutch pedal, sending it into ‘Autostop’ mode. When the vehicle needs to move away again, the driver simply presses the clutch to re-start the engine and engages first gear. For safety reasons, and for passenger comfort, the temperature regulator and brake booster vacuum control remain active in Autostop mode. And if circumstances require – for example, in start-stop traffic – the driver can manually deactivate the system using the ‘eco’ labelled Start/Stop switch. In order for Start/Stop to function, certain criteria have to be met. The engine needs to be up to full operating temperature, and the battery needs to be sufficiently charged. The outside temperature also needs to be above freezing and the Defrost function not activated. An energy management system responsible for trouble-free re-starting of the engine. The introduction of Start/Stop for ecoFLEX models is part of Vauxhall’s ongoing strategy to reduce fuel consumption and emissions across its fleet. The system first appeared in the Corsa 1.3 CDTi ecoFLEX model last year, allowing the car to retain its healthy performance from its 95PS engine, yet reducing emissions to 94g/km for the 3-door model (making it the most economical production Vauxhall in the company’s history) and boosting its combined fuel consumption to 80.7mpg. 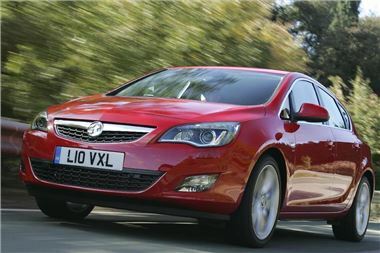 By Spring 2012, most of Vauxhall’s model lines will feature Start/Stop technology on ecoFLEX models, including many petrol-engined cars too. The Astra 2.0 CDTi Start/Stop 5-dr Hatch and Sports Tourer are available to order now. The model replaces the outgoing Astra 2.0 CDTi and is only available with manual transmission (a 2.0 CDTi auto model is also available without Start/Stop). Pricing for the 5-door Hatch starts at £22,410 for the SRi model, and £23,430 for the Sports Tourer SRi. The 2.0 CDTi Start/Stop can also be ordered in SE and Elite trims (Hatch) and SE (Sports Tourer).